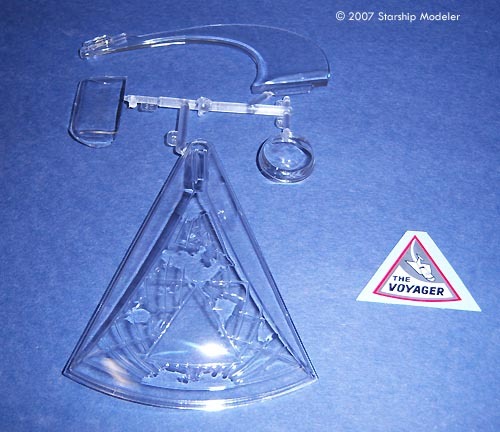 One of the most sought-after models from Aurora's heyday was their "Voyager". 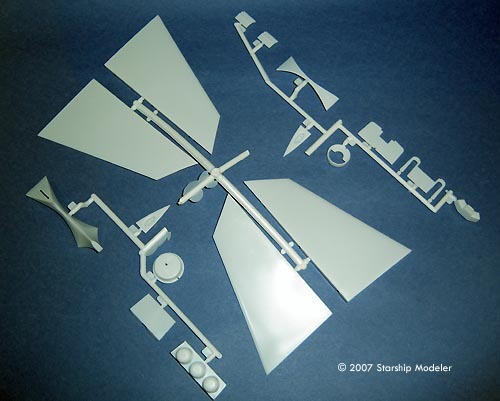 This kit, released only once (1969), depicted the Proteus craft used in the Saturday morning cartoon "Fantastic Voyage" - a spin-off from the movie of the same name, which was novellized by Isaac Asimov. The show was not a hit and kit was never re-issued; it now commands stratospheric prices on the collectors' circuit. Nearly forty years later, Moebius has answered the call and produced a new model of the Proteus, and kept it true to its roots in the Aurora kit. Enough with the history lesson, Grampa* - what's in the box? Everything about the kit's packaging and pieces evokes "Aurora": The boxart. The way the boxart is glued to the box, not printed directly on cardstock and then folded/glued. 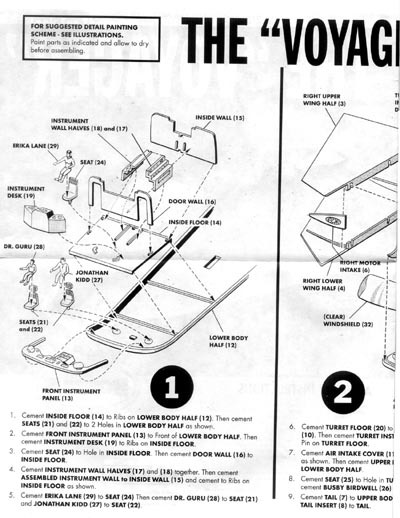 The way the instructions are laid out. The way the parts are laid out on sprues. Moebius obviously have a target audience in mind and they expended a lot of effort to cater to that audience - and good on them! It's good to see a company making that kind of concerted effort to satisfy their customers. But I'm not part of that target demographic. I was born the year Star Trek debuted; what I remember of 1969 was Nixon and Bobby Kennedy battling Commie Space Pirates on the Moon. Given that, how does the kit look? The answer: still looks pretty darn good. There's not a lot of detail, but given the subject's smooth exterior that's expected. Interior pieces, like seats and consoles, are simple but crisply rendered. As far as I can tell from taping the major pieces together, fit is excellent. I'll need putty, because I always need putty, but anyone less klutzy than I -- and that should be anyone reading this - should have no fit issues. Clear parts are admirably clear and distortion-free, so you'll be able to see any/all the effort you put into that interior. The one area I won't make a judgement upon is accuracy. I have never seen the cartoon, and the Proteus from the movie is decidedly different. Given the obvious lengths Moebius has gone to with this kit, I'd say it's almost certainly quite faithful to the original .... Aurora kit. Which was their goal, no doubt. Which they have met, brilliantly. If Aurora has a warm place in your childhood memories, you'll enjoy this kit. If "Aurora" evokes something different for you, it's still a good kit. 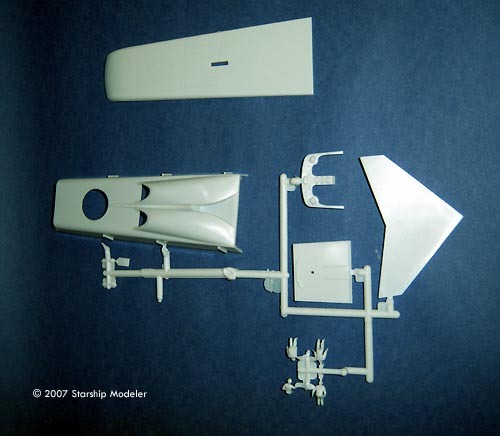 Ease of assembly and simplicity of paint scheme make it something novice and expert can have built over a rainy weekend. Many thanks to my wallet for providing the review samples. Manufacturers and retailers, interested in getting your wares reviewed and publicized on a site averaging 3500+ readers a day? Contact us! This page copyright © 2007 Starship Modeler. First posted on 4 December 2007. * You kids get off my lawn!